Generation Z, classified as kids and young people aged four to 16, is a hot topic right now. Also known as the ‘we want it now’ generation, they have never known a world without the internet and mobile phones. They have grown up with touch screens, smartphones, social media, fast broadband, video on demand and one-touch services. Gen Z has very distinct attributes from earlier generations as attitudes on social issues have shifted; they are interested in global social changes and aren’t afraid to stand up for what they believe in. They want to make and personalise things for themselves. 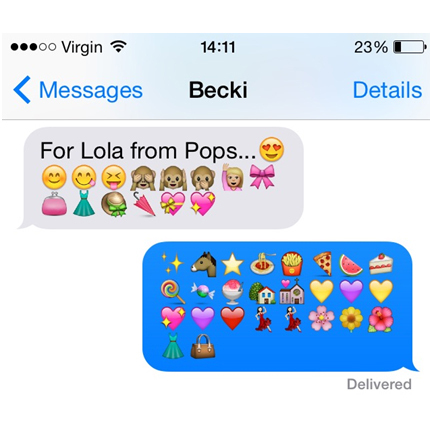 Last week I found my daughter sending a reply text message to her four year old buddy via my wife’s mobile phone. What struck me was that she can’t really read or write so was using emoji’s – those pictorial graphics my mum and I use to punctuate our text messages – to communicate. Communicating this way seems to be second nature to Gen Z, however, they are hard to reach through traditional marketing. They are constantly being bombarded with advertising messages: posters, banner ads, pop ups, TV ads, those annoying video ads that have to play before you can watch the YouTube video you want. This torrent of interruptions has generated a filter bubble around young people; they communicate differently on and offline to avoid interruption. To make things slightly more complex, this on demand generation don’t want to queue or wait. They think ‘perfect’ is boring, so where is the best place to catch their attention? Phenomenally successful campaigns like Sport England’s This Girl Can or Nike’s Better For It, demonstrate how brands are unlocking the power and passion of young people. These campaigns don’t see young people as one homogeneous group; instead, they recognise that young people have different personalities, motivations, hopes and fears. Their campaigns seek to humanise their brands and tap into the unique make up of the diverse segments that make up Generation Z. Since launching in January 2015 to January 2016, the This Girl Can video content was watched over 37 million times on Facebook and YouTube, with 540,000 women and girls coming together in its dedicated community. Altogether, 2.8 million 14 to 40 year old women across England said they have done some or more activity as a result of the campaign. Due to its success, there have been 660,000 tweets using #ThisGirlCan in its first year. Similarly, Nike’s Better For It campaign has been a huge success with the brand encouraging people to share their own exercise accomplishments on social media with #betterforit. The campaign has resulted in 262,753 posts on Instagram since the launch in April 2015. Millennials (born in the early 80s up to the early 2000s) also known as Generation Y, were the previous youth market. They are classified as ambitious but lazy, hyper connected but self-obsessed, and non-conformist but materialistic. In stark contrast, Gen Z sees through the thin veneer of superficial brands; they turn off their devices and have ‘dark’, ‘me-time’; when they are connected they are hard to reach but always in buying mode, and reward authentic brands with good purpose. Traditional values are embraced by the next generation. In an age of seven second vine videos being knowledgeable is important; ‘boring subjects’ are more shareable. They discuss current affairs and back social issues, wanting to co-create and make things for themselves. Generation Z understand the illusion of riches and understand reality. The pursuit of happiness is the definition of success. They want to succeed and achieve. Despite being branded the lost generation and with some of the world’s highest levels of obesity, Gen Z isn’t obsessed with being thin. Rather than the internet creating couch potato youths, robots and weak enfeebled youngsters, technology is showing truth behind the myth. In fact health is king. They smoke, drink and take drugs less than previous generations and many under 16s see the link between poor health and fast food. However, depression is increasing but this may be because mental health is less stigmatised today, this youth group face their problems head on. Although Gen Z have little money and can’t afford to buy, they share. As a result of this, their influence (and influences) can be huge, and way beyond their family circle. What should marketers and health organisations do? Think about context; understand what your audience likes and what they are doing then reach out to them in ways that relate to it. Understand your audience; how they talk, what matters to them, what attracts them, activates them, and makes them feel vulnerable. Stop doing things for young people; do things with young people. Don’t just tell them the answers, provide resources. Be authentic; if you have a good purpose, work out how you can make that true for your brand. Be brave; learn to adapt and adjust your outreach strategy if necessary. Creative communications agency Big Cat has marketing, PR and creative design specialists working together to provide clients in the events, leisure and third sectors with integrated marketing campaigns.